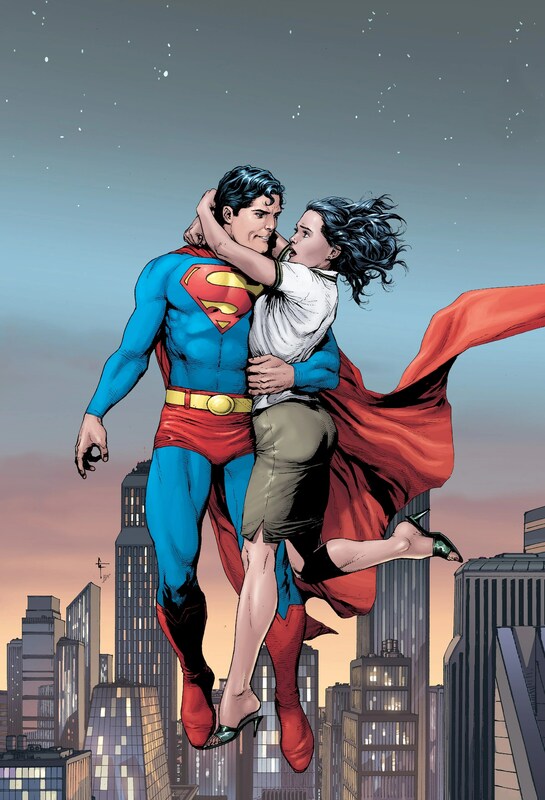 Romance & comic books are no stranger to one another, it’s just that since the over saturation of Superheroes flooding the market, it’s almost hard to recommend them a comic book fan what romantic comic. There’s so much that you can do in comic books, it’s just that when you’re giving them something different than action pages, then you’ll be lucky not to get hated by the audience. I, as a fan of romance and comic books, am not blind to see that there are plenty of that I look to read. Somehow, there are new comic book series coming out that deals with love and relationship that old, established superhero comic books refuse to develop and evolve. It’s already bad enough that Marvel and DC Comics refuses to let marriages happen to their characters (Batwoman) while other comic book companies managed to bring romance into new grounds that not even movies have yet to achieved. This is a list that shows that you don’t really need to wear a costume to get the girl of your dreams. For many decades, the story of Archie Andrews have always been bouncing back in forth for both Veronica and Betty, in humorous fashion. There have been a lot of comic books tackling the romance genre in the past, but Archie comics withstood the test of time because the series always offered a lot of variety of humor that got many audiences laughing in nearly every issue. The Archie fanbase has been divided to who’s their favorite character, but when choosing the best girl for Archie, there’s always room debate. Archie always opts for Veronica, except when Betty manipulates him into choosing her. And Betty often acts as Veronica’s friend, even if Ronnie doesn’t appreciate it. The eternal triangle of Betty-Archie-Veronica cannot be resolved. This is a gimmick to sell comic books, like the recent assassination of Captain America, or the death of Superman years ago. Though there’s no resolution for this relationship, it managed to make it on the list because it was something different; it was all humor. The Big Bad Wolf and Snow White have worked through their differences to become the nexus of Bill Willingham and Mark Buckingham’s postmodern fairy tale epic, Fables. Once a brooding, enigmatic grump, Bigby Wolf retired from stalking grandmas and pigs to raise a litter of magical human-wolf hybrids with the fairest princess of them all. There’s a lot that could be mentioned about this married powerhouse (we’re on issue #128 for those counting), including their cathartic courtship and parentage of a sentient wind baby, but Bigby and Snow form one of the most mature, stable unions in comics, leaving the drama out of their relationship to focus on the Grimm threats their magical community faces on a daily basis. Peter had gone through a lot. The death of Gwen Stacy and supposed death of Norman Osborn on top of all that he endured at Spiderman was much for him. Yet, Mary Jane was about to love him, help Peter get better and become a better man. And the two seemed made for each other. She was the spunky Redhead who loved Peter and cheered him on; yet also understood Peter’s need for being Spiderman. Peter,in turn, was the loving man who helped balance out Mary Jane’s adventurous nature while finding his own. This couple loved each other. This couple had some deep seeded issues. 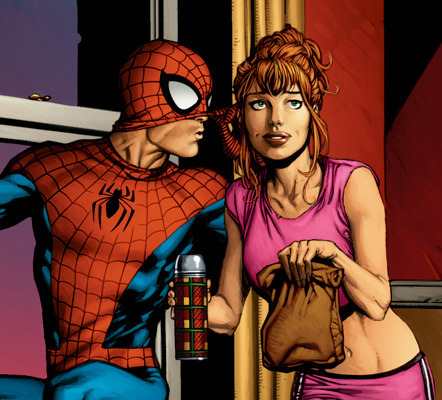 Like Mary Jane’s need for attention at times leading her to either be a flirt to other men or demand more out of Peter when she knew it was a bad time. Or Peter not being as supportive of his wife’s career at times when he should have been. And need I remind you their BIGGEST crimes . . . One More Day & One Moment In Time. Those two shining turds are two of the greatest reasons why this couple can’t be any higher on the list. The fact that Mary Jane essentially helps Peter make a deal with the Devil (Mephisto but I am of the mind of Linkara on this . .. he’s the Devil) and later on shows how jealous she is that Peter gave up their marriage is complete and utter bull! The fact that she would tell Peter that being with him is like being a battered wife . . . okay, there was that one time a clone of Peter hit Mary Jane but seriously . .. it was a clone and Peter was not responsible for that. And you don’t compare a relationship you willing stayed with that long and compare it to being a battered wife when half the time you are cheering him on to be a hero. And here we have one of the most beloved X-Men relationships ever, responsible for bringing an entire generation of readers, ‘shippers, fanfic enthusiasts, and soap opera junkies into X-Men comics. While, much to many fans’ dismay, Gambit and Rogue have been mostly on the outs since Gambit was revealed to be the long-rumored “X-Traitor,” their continued appearances together (like recently in the Gambitongoing series) constantly stoke rumors of reunion and reconciliation. The most compelling aspect of the relationship between the Cajun ne’er-do-well, and the untouchable Southern bombshell, is that it has almost always existed at arm’s length literally. It’s that whole aforementioned untouchable thing, you see. Rogue’s power has traditionally been uncontrollable, in the sense that there’s a risk for anyone who makes skin-to-skin contact with her of losing not just their super-powers, but their memories, their identity, and possibly their life. 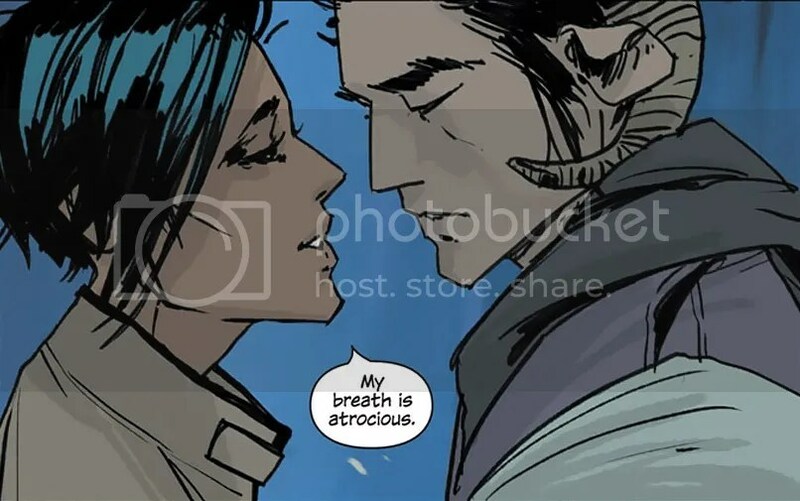 With that kind of obstacle in their way, the passion that undoubtedly exists between the two usually just smolders, unrequited, yet undeniable, so in the moments when Rogue and Gambit have been able to, for one reason or another, actually become intimate, the release of anticipation is palpable. With Gambit and Rogue it’s never been as much a matter of “will they/won’t they,” as “can they/ can’t they,” and for many fans, the question will always be more important than the answer. 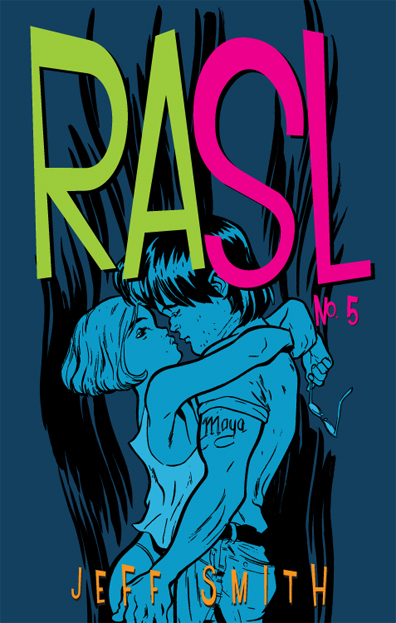 For those who haven’t read this adrenaline-gushing sci-fi opus, RASL is an acronym for Romance at the Speed of Light, though “romance” might be too optimistic to describe the volatile relationship between scientists Rob and Maya. While working on a risky military project, Rob has a steamy affair with his partner’s wife before tattooing her name on his bicep and leaving his job to hijack priceless art in parallel dimensions. As can only happen in physics-bending noir, Rob finds other versions of Maya in his reality-hopping journeys and continues his fling across time and space. (Is it cheating if you seduce your best friend’s wife in a parallel dimension? Is it cheating if you’re cheating on your best friend’s wife with her parallel dimension variant? Discuss amongst yourselves). The real truth behind this pair is far more insidious than initially presented, but what Rob and Maya lack in stability, they more than make up for with a chemistry that packs more electricity than a Tesla current. Since the title first started, Marvel’s Fantastic Four has always been about family, and at the heart of that family are Reed & Sue Richards, better known as Mr. Fantastic and the Invisible Woman. Right from the start, their relationship was rocky, mostly thanks to Sue’s attraction to just about anybody that hates Reed Richards and Reed’s attraction to science, but the Richardses have one thing going for them that nobody, not even the couple at number one, has they’ve made it work. They’ve stayed together through thick and thin, even when they’ve found themselves on opposite sides of the superhero Civil War, and have raised a family, and flourished as a couple. It’s easy to wonder how they’ve made their love last. Reed can be an emotionally absent jerk, and Sue is often depicted as flighty and given to infatuations with Reed’s enemies, but the truth is as simple as love can often be in real life; they just do. They love each other, and just like real love, their relationship is built on an emotional trust that has survived the some of the worst crises any world can offer. They rely on each other to be what the other cannot. Sue is Reed’s emotional core, and Reed is Sue’s logical center.Never as strong apart as they are together, Marvel’s premiere “power couple” are one of the best examples of love gone right in comics. Saga ruffled feathers a few weeks back for including some risque imagery in its latest chapter (come on folks, Saga has always featured weird aliens strutting around in their birthday suits). But the largest engorged organ behind this stunning title is its heart, beautifully exemplified between star-crossed lovers Alana and Marko. The first issue captured the endearing chemistry of its married couple as they gave birth to their first daughter, Hazel, propelling two militias on a cosmic goose chase to capture the new family. Despite vicious bounty-hunters, planet-sized monsters, and vengeful ex-fiances, Marko and Alana show that love perpetually conquers all no matter the suicidal odds. And speaking of unconventional couples, a miniseries starring The Will and The Stalk (the most creepily attractive spider mutant Paste has ever seen) wouldn’t be a terrible idea, either. Craig Thompson’s autobiographical journey through the teenage onslaught of insecurity, lust, and self-realization is painfully evocative. The story follows a young Thompson as he meets beautiful coed Raina at a Christian Camp, then spends two weeks with her and her family under the pretense of plutonic friendship. Obviously, the two fall in fevered, mind-shattering love in a way only two unaffected high school students can, and therein lies this book’s singularity: Blankets will bring you back there. To that unadulterated, wondrous state of mind where love was a new frontier filled with angels and ecstasy. Those same angels also serve as Thompson’s main conflict, as his fundamentalist upbringing clashes against the groundswell of emotions he feels for his introductory inamorato. It’s real love with real problems. But the innocent delights Raina and Craig provide each other are only marginally greater than those given the thousands of readers who have fallen madly in love with this book. This is just simply the best romantic story I’ve ever seen in my life. It’s the one story that not only tells it so well but it speaks to you spiritually. Blankets was just simply beautiful by every sense of the word because of how Craig Thompson describes his real life story as a hurtful kid and finding Raina as his healing. I just simply felt connected with these two people (yes this is an autobiography after all) that it was once in a life time life-changing. Yeah, yeah, yeah, you can call “furry” all you like, but these two cartoon characters are the reason why I got interested in the romantic genre in the first place, and we’re talking about me watching Sonic SatAM back in the early 90’s. I always thought it was interesting that two characters have fought together in a middle of war with Nature vs. Machine while at the same time holding the strength together. Now when you see the SatAm series, you can see it’s a little light hearted and playful where Sonic annoys Sally and Sally get’s aggravated when she’s focused on being a team and carry out the battle. But things really started to sparkle when they finally beat Robotnick and had the power of love within each other. We never got a chance to see where the relationship continued since the SatAM AM show got cancelled, but thankfully the Archies Comic Series continued the story and the relationship by a mile away. With all the personalities that populate the Freedom Fighters—as well as Sonic not really being one for responsibility—there needed to be a character that was the emotional center as well as the voice of reason within the group. This was something that was needed for storyline to be taken seriously, which is something that both Hurst and Archie Comics wanted. And frankly, if you needed someone to be a love interest for a speedy blue hedgehog that needs a voice of reason and loves chili dogs more than a regular at a Coney Island, then all I can say is this: mission accomplished. Truth be told, these characters are teenagers, with all the emotional drama that goes with it. Fights happen. And from what I read—before the current storyline—they seemed to have made up and found a balance where they can do their things while being together. The ultimate thing is this: there were a bunch of teams working on trying to develop the Sonic lore early on. From this came two distinctly different characters that vie for our hero’s affection. And while I’d like to say that it is clearly obvious which one is better, the truth is that there isn’t a clear consensus. I think you guys know where I stand. If you’re one of those that think that Amy Rose is better, please explain to me why you believe that. And do so in a manner where I’m a child that doesn’t understand. I don’t think you’ll convince me that Amy, Bunnie Rabbot (that actually happened), Mina Mongoose, Fiona Fox or any other relationship Sonic has been in is better. So why so much relationships in an adventure of Natured vs. Machine? What do you expect? it’s Archie Comics, they’ve been very good in romantic triangles for decades that sold millions! But one of the highlights of the comic series for me was (after so many years so Sonic and Sally together) when they broke up. Boy, after those many years of being connected with the characters, it really broke my heart to see they’ve finally separated. It was so hard to see any of the Sonic the Hedgehog issues because it reminded me of my own heart break of my first girlfriend back in high school. I do admit that I get teary-eyed whenever I see the issue when they’ve finally broken up. Miraculously enough, even though they’ve broken up, other romances of the series developed as well. Like Bunnie Rabbot marrying Antoine, Knuckles falling for Julie-Su, and much more. It was not until 2011 when Sonic and Sally got back together that made me the happiest person in the world to see that happen after those long years of separation. 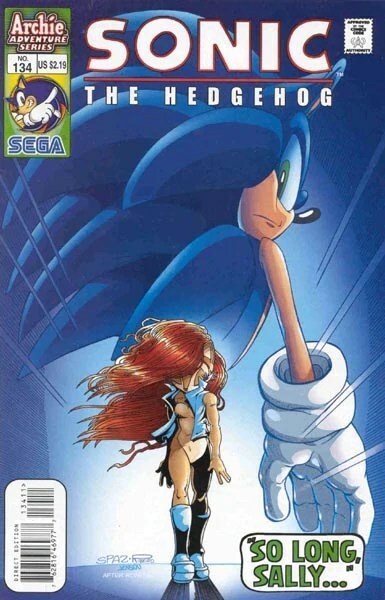 Hell, they even went back in time to when they actually first met in Sonic Genesis, something that we all never knew about (Sonic Genesis), but after all those years of waiting to get them back together, it hurt me even more when Sally had to sacrifice her own self to save the world from Robotnik’s planet destruction by roboticizing herself. It’s a shame that none of the video games has ever made stories and characters this engaging which is why I always say that the Sonic the Hedgehog comic series is always better than any Sonic video game. You can tell whatever is the best Sonic the Hedgehog game and I’ll still say it’s not even as good as the Comics series. There’s always a new challenge and a new shock factor that always makes this adventure more and more exciting. That’s why Sonic the Hedgehog comics is still the longest lived comic book series and Archie’s greatest success! Habibi fundamentally shares the same themes as Craig Thompson’s previous romantic foray, Blankets. Both focus on inaugural love, religious introspection, and how the two inform personal identity, but Habibi is also a meticulously-researched masterwork that could almost pass as a modern Cecil B. DeMille epic. This is probably the most complex love story I’ve ever seen because we’re talking about two escaped slaves who did everything to survive and protect each other. Dodola at age 7 took Zam (as a baby) and raised him. It was strange to see if it’s a brother-sister relationship or mother-son relationship, but as they got older, they started noticing each other as Zam is trying to resist his temptation to the one who sheltered and fed him while Dodola didn’t want him to transform to the men that she hated. You wouldn’t believe what Dodola did to keep Zam safe and if I told you what she had to do, it would turn a lot of people off because of the very dark subject matter. Dodola and Zam believe in each other so very much that when they got caught and separated from the slave owners, the main thing to keep reading is to just see them comeback together. Never have I had the nervousness of just changing to the next page because it was so damn thrilling and yet so scary to see how much worse is it going to be for them not being together. I cried so hard for these two characters to get back together because it’s how much they truly love each other now as lovers. Each time I’ve turned another page of this wonderful graphic novel it’s always getting worse for them as they struggle more and more to keep each other alive. This is truly the meaning of love; sacrifice, help, love, and will. 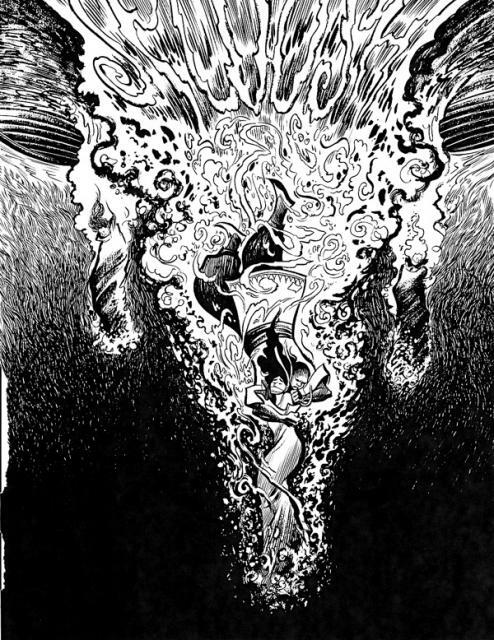 If you want to really see great romance stories, Craig Thompson is the master of telling its audience such story. It’s amazing this single man changed my life twice, that’s something I don’t see from any artist or storyteller.